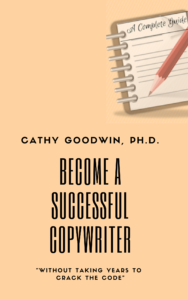 Whether you want to start a new career, work more effectively with pro copywriters or discover the path to a new, lucrative career of your own, click here to learn more. 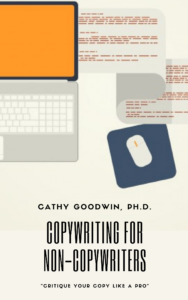 So you want to be a better copywriter, but you don’t want to become a copywriter? 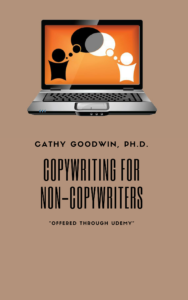 You want to figure out how to turn your offer into persuasive language. You want to get straight talk on benefits, features, headlines, and bullets. And you want to walk through the copy you’ve written, one section at a time, revising and tweaking and going from so-so to sizzle. Get more information and a 52% discount when you click on this link. 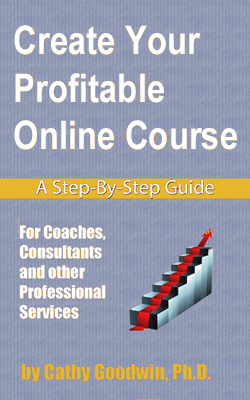 This Quick Start guide shows you exactly what to do to get more coaching clients. 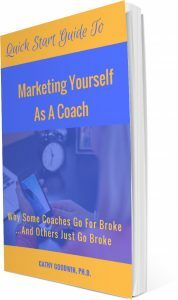 If you’re new to coaching, or wondering why you’re not doing as well as expected, then read this guide before you spend more money hiring 5-figure coaches and buying expensive home-study courses. I’ve worked with dozens of coaches. 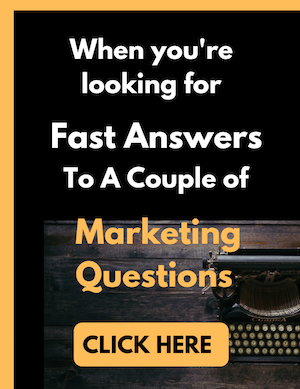 Based on their questions, I condensed the essentials of marketing into this program and added some bonuses to help you start quickly. Learn more here. 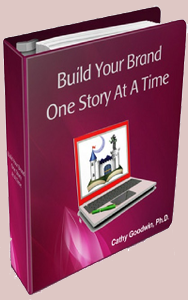 Build Your Brand One Story At A Time. And she guided the marketer to this landing page to download the very contemporary truths about storytelling, with a step by step guide. “More than a cappuccino,” the copywriter whispered, “but less than a couple of networking lunches.” And it’s a lot hotter than the coffee, she muttered, taking the final sip. Learn more here. 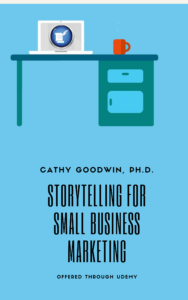 Discover how you, as a small business owner, can draw on the power of storytelling to make your marketing more effective and also more fun. Discover why Cinderella makes a lousy marketing story — and why the hero’s journey story probably won’t do a thing for you. Stop looking for “your” story and start telling your marketing story. Use this link to learn more about the course and claim your 54% discount. Learn more here. Have you been thinking about creating your online course, but you’re overwhelmed by all the advice out there? Not to mention the high price tags of courses with dozens of dizzy-making sections. This self-paced study program gives you everything you need to get started. We keep things simple. You’ll avoid costly detours and create a course that delivers value to your audience (faster and more easily than you’d believe possible). Learn more here. Guest blogging has become very popular… but can you reach marketing success by writing guest blogs? The answer is yes, if you follow a few important steps. This short course simplifies the process, identifies what’s non-negotiable and helps you avoid the most common pitfalls. Learn more here (and claim your discount with this link). For a lucky few, the decision to hire a mentor was the best one they ever made. For thousands more, hiring a mentor can be the most costly mistake they ever made. If you make a mistake (and I certainly have), you’re not alone. There’s a veil of silence around the topic of choosing mentors. The mentor who’s perfect for your colleague or conference buddy might be all wrong for you. 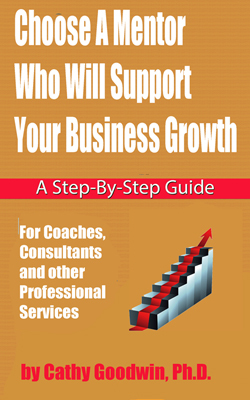 This report breaks the taboo and walks you through a step-by-step series of questions to choose the mentor who’s best for your business. Learn more here. You Got Hired: Now Build A Client Relationship. You spend time and money attracting clients and customers. 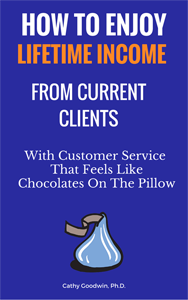 The real rewards come from longterm clients. Not only is it easier to keep a client than to get a new one, but also long-term clients are more likely to write testimonials and give you quality referrals. Yet it’s all too easy to make simple mistakes that drive away your best clients…often without realizing what you’re doing. Learn more here.